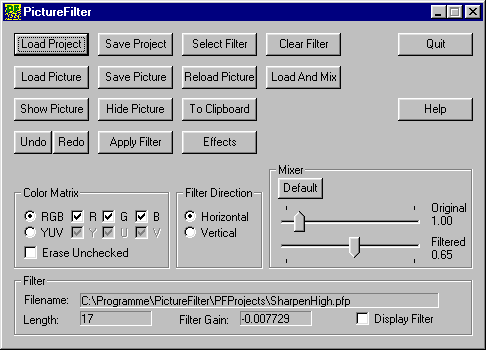 Filtering Picture data with user defined FIR Filters is the main purpose of the PictureFilter program. The downloadable program package includes various different FIR Filter input files which can be used directly. Just press the Select Filter button and select the filter of your choice, e.g. a Lowpass filter. All filters included in this package were designed using the WinFIRFilterDesigner program. PictureFilter however can import any ASCII based FIR Filter definitions from third party programs and is not restricted to be used together with the above mentioned program. The following table shows four pictures that demonstrate the key purpose of the program. The ability of PictureFilter to load any FIR Filter definition, together with the feature to apply them on selectable color bands in the RGB or YUV domain, in addition with the Mixer functionality and various add-on effects, provide the user practically unlimited possibilities. 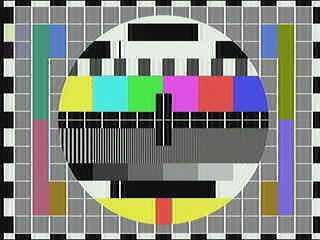 The upper left picture is a small JPEG image of a TV test-screen. The upper right picture shows the same picture after horizontal highpass filtering with a 37 tap filter. The lower left picture shows the same picture after horizontal lowpass filtering with a 37 tap filter and a cut-off frequency of 0.2 (frequency range 0...0.5). The lower right picture finally shows the same picture after vertical 7 tap median filtering. All filterings were done in the RGB domain with no special selections. It is possible to apply filtering only on selected color bands, e.g. in the YUV domain to enhance the luminance detail level and keeping color information untouched or vice versa.